No--it is not Monday! But it feels like it! 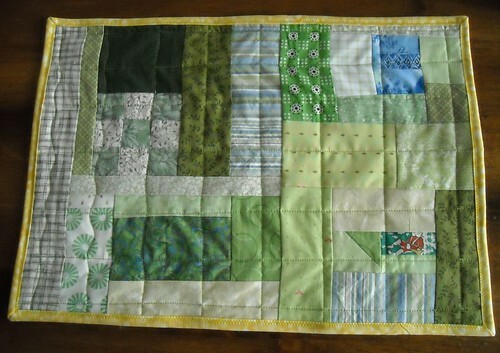 I finished up the green placemat-I love how there's a mix of some of my really old fabric in there, some from my nephew's baby quilt I made a couple years ago, and some newer stuff too. I think that sewing the binding down by machine make the binding a bit ripply. I tried to steam out the wave, but it didn't really work. Turns out that my little girl is using these placemats to wrap her baby in; I need to make a bigger doll quilt for her. This was my last finish for the Spring to Finish project--I got about 6 finishes done, not exactly the ones I had on my list, but I made good progress. Here are last week's 9-patches. I'm really going to finish this one up, too! I have the first 3 for this week cut out and ready to go. I got these fabrics last week for a super secret project. 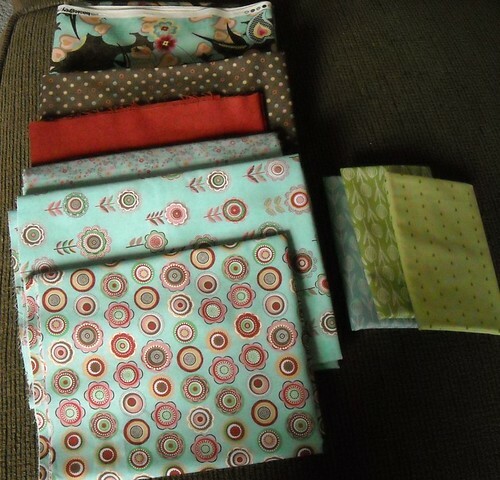 Well, the Blush is for a super secret project; the fat quarters are just for fun. My green selection was getting really sad. 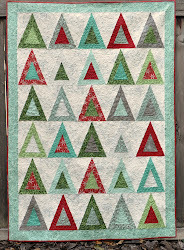 Natalia from Piece N Quilt had a great sale--thanks Natalia! I've got a busy week ahead--my boys start their 4 weeks of swim lessons today and we're still easing into summer, working on routines and making sure they have enough jobs to do and not too much TV to watch. Also need to clean up from the long weekend! 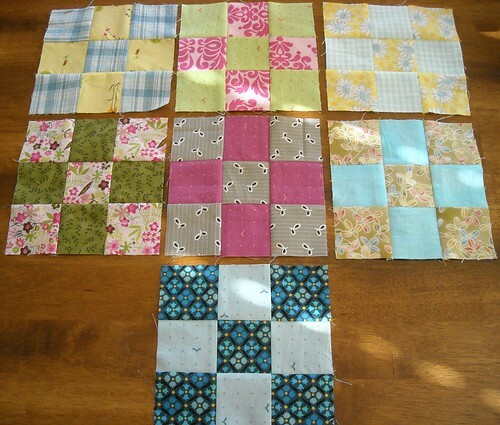 Great job on getting your nine patches done this week and love the new fabrics! I love the blush line. Looking forward to seeing your secret project once you can share it.